On Tuesday the great and powerful Utility and Review Board delivered its verdict on the shape of the municipal districts in the next election in HRM. The UARB—as its’ friends know it—had already decided on the size of council back in the summer. 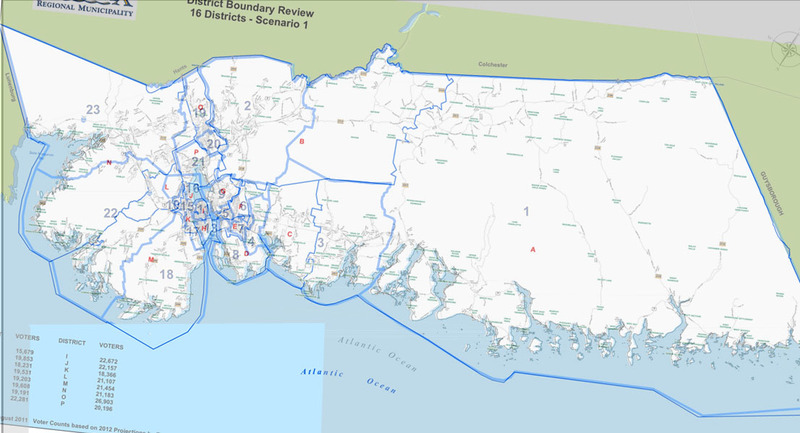 Downsizing council from 23 to 16 required re-districting, and the UARB had ordered HRM to report back with a proposal. The UARB is an appointed provincial board, where more and more power has rested since its predecessor was created in 1909. The board is charged with oversight of utility rates, liquor, theatres and amusements, railways—it even sets the price of gasoline. If you’ve been keeping score, HRM said “our council is the right size” and the UARB said “nope, make it 16” and then the UARB said “nope, I don’t like your district proposal” and made a bunch of changes. Is this a sign of technocrats run amok, wielding tremendous undemocratic power? Rather, I think the other, bigger, better run elected body in these parts, the provincial government, has recognized for some time that municipalities in Nova Scotia truly are creatures of the province. Municipalities exist only because the province allows them to, and how they exist is entirely in the province’s hands. The folks in the Legislature have this well staffed board of lawyers who ensure that municipalities act within the intentions of the laws that created the municipalities in the first place. The UARB’s ruling says that they adopted the districts from Scenario 1, but with so many changes that it seems like an almost totally new proposal. Where the Board differed with HRM staff most was over the importance and definition of what a community of interest is. The HRM proposal had many up in arms as identifiable communities were split down the middle, proposing that some commercial districts, school and recreation areas, and residential zones that function as one unit, were to be represented by two or more different councilors. Most interesting was the case for Cole Harbour. In 2007 the Board ordered HRM to include Cherry Brook, Lake Loon and Lake Major in Cole Harbour, at the request of citizens there. The HRM proposal to separate those communities was rejected, creating a large Cole Harbour district from Westphal to Lake Major, Colby Village to Cole Harbour proper. Similar moves were made to keep Upper Sackville together, the area around Main Street Dartmouth, and Fall River and Waverley. While keeping communities of interest in a single district was a major factor for the Board, having all those communities in each district actually be related to each other was not. The clearest example is how Portland Estates and Portland Hills have been attached to Eastern Passage, creating a district that wraps around Shearwater, with two halves that have little in common. This is repeated in most of the suburban/rural districts from the long narrow Fall River and Eastern Shore districts to the South Shore and Clayton Park West on the other side of the Harbour. These districts have a large chunk of built up suburbs on the edge of the urban area, or as we used to call it, the city, and then radiate outwards in to the far less populated rural parts of the region. There’s little in common between residents of Waverly and Upper Musquodoboit, or Clayton Park West and Ketch Harbour, but it has been like this forever for HRM. In the end, the results could be interpreted as three Halifax, three Halifax west, three Dartmouth, three eastern county, and three Bedford Sackville seats, and one South Shore. Some are saying that the suburbs have won, some will no doubt say the city proper is taking over. Only time will tell whether this new council will rise above and focus on regional rather than local priorities.